Razinpaws Kennels is nestled in the bush near Wisemans Ferry. The peaceful existence allows for a calm and happy environment for the dogs who live there and the schnauzers who are born there. It is all about the dogs! Nothing is spared to make sure they are comfortable and most of all healthy and well balanced dogs. Razinpaws breeds miniature schnauzers which are a great all round companion dog. They come in three colours; black, black and silver and pepper/salt. 02 4566 8149. To contact via email, use the contact form on the contact page. 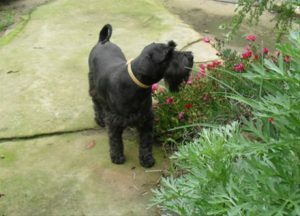 My husband and I are looking to get a schnauzer in addition to our family. When do you next expect to have puppies available? I am not sure if I have already responded to you, I so have some puppies at the moment ready to go to their new homes. If interested let me know. my contact number is 4566 8149. Do you have any black and white minis? I have some beautiful Black/Silver pups ready to go to their new homes. They are wormed, chipped, vaccinated, Vet checked and will come with their Pedigree. If interested you may contact me on 4566 8149, you are welcome to come and view the pups anytime. We have a 6yo salt & pepper mini schnauzer whom we love! We are after a female mini salt & pepper schnauzer in Dec or January. We have visited you on several occasions & were thrilled with your farm & care for these wonderful dogs. Please call me or email…0427 913 313. Hi Rachel and Tim, Have you found a puppy yet. I am not sure but I think I may have replied to you from my emails. Are you still looking for a puppy ? My wife & I are seeking a new puppy male or female as a family companion & sibling for Basil our 10 year old Mini Schnauer.We have been Schnauzer owners since 1985. Firstly we are still so delighted with our wonderful schnauzers. Barkley is very much the puppy even after 2 years, bringing us lots of laughs and Bessie (Betty) is still the caring mum. I am writing to see if you would have any dogs that need adopting, a retired breeding dog or an unwanted dog. I have two people in mind that would adore caring for a dog. It doesn’t need to happen immediately. They are not in great financial positions but would enormously help them emotionally. I thought of contacting you first, as Betty has been fantastic, rather than going to Monica’s rescue . Let me know if there is a chance you can assist. Hi Tricia Wishing you a happy Christmas and healthy enjoyable 2016. Our two pups now Two get on so well thank you David. Brian Newtown..
Molly has just turned 4 we love her to bits. Hi Trish, our gorgeous (3-4 year old) Abbie is so perfect. As you predicted we need to get her a little sister. Tricia you are just the breeder we have been looking for. You love the animals, look after them so well and we were just so impressed with everything.